This elegant and colourful set of table linen is composed of table runner and napkins of two different cotton at your convenience. 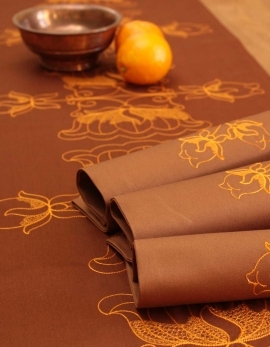 A decorative lotus flower on rusty color cotton will delicately contrast your table with this elegant and bright orange thread. The lotus flower symbolizes in many traditions purity and spiritual fulfilment. French fabrication. 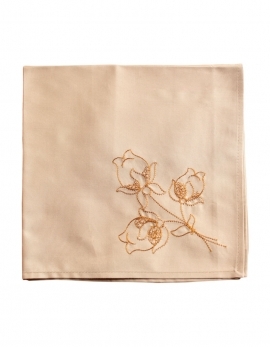 Embroidered napkin with bright orange thread on a light percale of beige rose cotton. Neat miter-corners. Table runner made with soft and thick pure cotton, rusty colour, embroidered with bright orange colour thread. 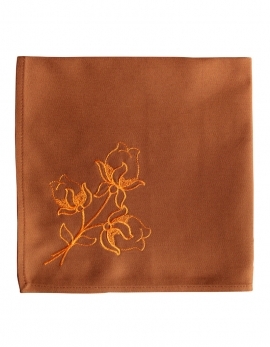 Soft and thick rusty color cotton, embroided with bright orange thread. Neat mitter corners. Made in France.